As you may know, some Radeon HD 6850 have been sent to the press with 1120 scalar processors instead of 960. KitGuru has published a comparative article between HD 6850 with 960 shaders processors and HD 6850 with 1120 shaders processors. 1120 shader processors means 160 scalar processors in more or an increase of shader computing power of 16%. ShaderToyMark is a pure and really intensive pixel shader test. Most of shaders used in ShaderToyMark are math shaders (few or not texture fecthes at all). 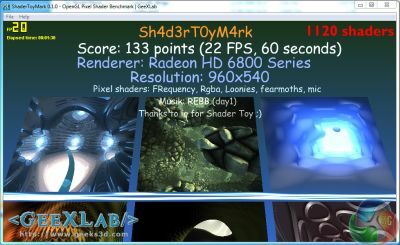 ShaderToyMark is nearly a GPU computing application! And guess what? There is exactly an increase of 16% between both versions of the HD 6850 (see the chart above). In TessMark 0.2.2 (OpenGL 4 tessellation benchmark), it’s another story. In normal tessellation mode (which correspond to a tessellation amplifation factor of X16) the difference is around 14% which sounds normal. But in moderate tessellation (factor X8), the difference jumps to 36%. Don’t ask me why, I currently have no HD 6800 series in hands so I can’t test TessMark to see how it behaves with HD 6850 / HD 6870. In normal tess level, MSI R5770 Hawk gets a score of 7515 points, whereas the HD 6870 scores 8342 points. At first sight, the scores of the Radeon HD 6850 with 1120 shaders look normal. Actually, seems there’s a problem in the TessMark score of the 6850 HD with 960 shaders. This score should be higher like around 16000 points in moderate tessellation. But I stop here because I don’t have a HD 6850 nor HD 6870. Maybe there’s a bug in TessMark, or in the OpenGL driver of Catalyst 10.10 or in the measure… If someone has a clue, the comment section is there for you! Can bi BIOS used from 6870, just with some downclocks maybe? The tessellation difference is because for such synthetic tests like TessMark, the bottleneck can be in the fixed function tessellator component. As according to AMD press release the HD6000 series has double the ammount of tessellation throughput than the HD5000 series, it may mean that for the different shader configs they put different sized tessellator unit. Well I think I’ll wait for a proper article on this. KG has a reputation for well… ya know. I also think I saw on another site that they were one of the sites that cocked up the 6850 mixup, which is not how they’re portraying it now?! @ Thud, Check your facts. All of the published KG reviews regarding the 6850 Are using the card variations with the 960 Unified shaders. Thanks to JeGX For publishing this. It hopefully Will help clear things up. Thud, you are clearly confusing their sometimes controversial news with their reviews, which are great. Zardon has been honest with the reviews and has shown that all their reviews are using 960 shader 6850’s, the results in this comparison actually call back to the other reviews and you can see the differences clearly. All looks good to me. the forums i visit see it. and photoshopped the GPUz uploading a new pic. top of that, the GPUz on that page shows the 1120 shaders still (oops!). Here you can see the GPUz overlayed, and how they positioned it just out of skew with where it would have been, and also forgot to change the filrate. Too many conspiracy theories for my liking. I always rely on my own testing for accuracy. I bought a HD6850 on friday, and it arrived yesterday. I ran my own tests (its an XFX board with 960 shaders, sadly!). My HD6850 arrived and my results match exactly what KitGuru posted for Tessmark and Shader Toy. 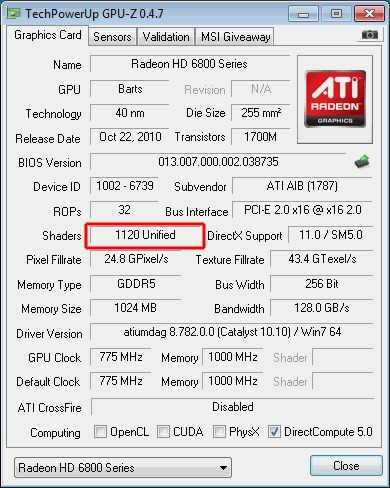 What a shock, the gpuz screenshot disappears from Kitguru and then, completely randomly, some users post here who just happen to have bought the card, happen to have read this article and happen to have the same scores (and specs?) as Kitguru… you couldnt make it up. Actually you could because they just did! I guess its ok to just spout hatred around the net, not sure what your deal is. relax man, its only technology. The joys of the internet are that there are always tons of options to read other sites, but I guess some people get banned and go on personal vendettas! “The 6850 cards used in the kitguru reviews all had 960 shaders, this is why the results between our sapphire and Xfx reviews are identical. If one of the cards had 1120 shaders the results would be different between Reviews. We alerted sapphire to this shader issue and we tested with another card for performance results. We have several reference boards and other partner boards so this was not an issue. Systems between reviews are identical.